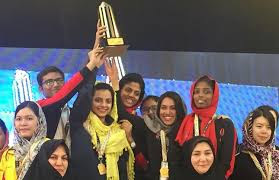 The Indian women chess team on Friday beat Vietnam and China to score a gold in the blitz event of the Asian Nations Cup Chess Tournament in Hamadan, Iran. Comprising of Harika Dronavalli, Eesha Karavade, Padmini Rout, Vaishali R and Aakanksha Hagawane, the team finished with 21.5 points, Vietnam settled for silver with 18.5 and China clinched bronze with 17.5. It is India’s first gold-medal finish at the event since 2014. Of the team members, while Eesha and Padmini are International Masters, Vaishali and Aakanksha are Women International Masters. Harika, the fifth member of the team is a Grandmaster. Turns out that the team managed the feat despite a tired start. Besides the blitz gold, India managed to score a silver in Rapid Women section. India also clinched a gold in the Classical category.